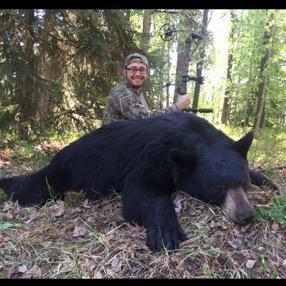 This small family-owned operation in central Alberta approached us early in 2018 about working with them to market their spring black bear hunts. After speaking with the outfitter at length, and after all of their references gave glowing reviews, we gladly signed them on with us. This outfitter had previously guided for a different outfitter, but when this territory became available, he jumped on it, as he grew up in the area and has hunted there since he was 12 years old. 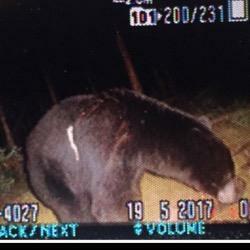 He hunts a vast parcel of Crown land in WMU #338 that is about 2,000 square miles, most of which is bush, and he has the exclusive outfitting rights for bears. The bears here commonly reach 7ft.+ in size, and there are some color phase as well. Hunting is over bait from treestands or ground blinds. Your guide will drive you to and from your stand each day, and as the stands are spread out over a large and remote area, expect quite a bit of car time each day. As with most north woods bear hunts, most of the hunting is done in the late-afternoon/early evening, when the bruins are the most active, with some fishing available in the mornings or once you’ve tagged out. Expect to arrive back at camp very late each day. 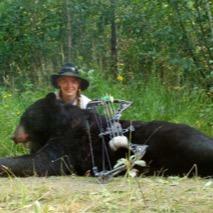 However, if trail cameras are showing bear activity during the middle of the day, your guide may have you sit all day. In addition, there are wolves in the area, and they could show up at any time of day. In fact, one of this outfitter’s 2017 hunters took a bear and a bonus wolf (and he may have been most thrilled with the wolf!). Hunts are conducted throughout the month of May, and he takes a total of only 10 hunters per year. This doesn’t even dent the bear population in this big territory, so he will allow hunters to even harvest a second bear. Accommodations are in a rustic but modern farm house, with delicious home cooked meals. Parties of up to 5 or 6 can be accommodated at one time. 6-day hunts in May with rifle, muzzleloader or archery/crossbow – $3,500 USD + $500 USD for 2nd bear*, including guiding, food and accommodations. HUNT WOLVES FOR FREE! Non-hunting observers are welcome for $150/day. Prices do not include 5% tax, processing, taxidermy, gratuities, etc. *FOR 2018 ONLY, HUNT NATION CLIENTS CAN TAKE A 2ND BEAR FOR FREE – JUST $3,500 FOR 2 BEAR LIMIT! 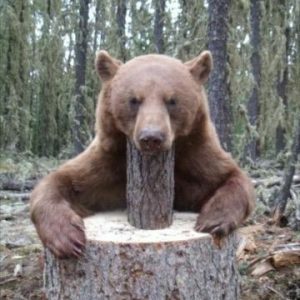 Bear licenses are $275 USD plus 5% tax, but INCLUDE A WOLF LICENSE! The outfitter will issue it to you. 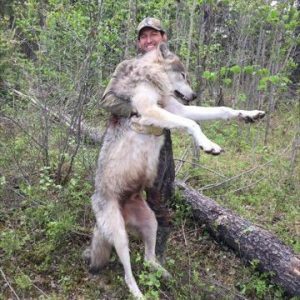 You will need to fly into Edmonton and rent a car (about 2 hours’ drive West to camp near Edson), or the outfitter can arrange to pick you up for $200 per car load of hunters. HUNT-NATION KNOWS CANADA – WE EVEN HAVE AN OFFICE THERE!